With over 6 decades of industry expertise, this privately held manufacturer continues dedication to building the highest quality product backed with personalized customer support. 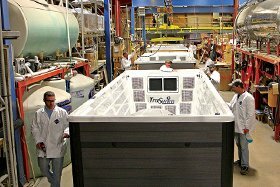 PDC Spas, Plastic Development Co., Inc., located in the heart of the Northeast, proudly employs Pennsylvania craftsmen to design, develop and build each and every unit from the beginning to end. PDC Spas continues to lead in exceptional hydrotherapy innovation across the globe. As founders and owners of numerous patents, PDC focuses on improving product and the consumer experience in developing products that perform better and last longer than the competition. PDC Spas is respected not only in the hot tub and swim spa industry, but professional sports arenas and our military have recognized our quality and now reap the benefits of warm water massage and exercise. Well known teams such as Kansas City Royals®, Pittsburgh Steelers® and Dallas Cowboys® have improved their game with the help of PDC Spas products. Currently, PDC Spas is proudly in development with the Navy Seals® furthering their training with the aid of effective aquatic exercise utilizing TruSwim® technology.